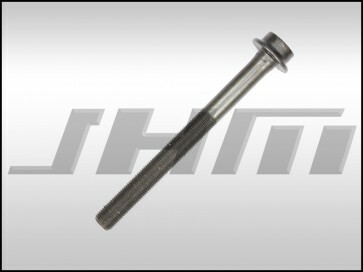 This is a brand new, OEM Cam to Cam Adjuster Bolt for the B6-B7 S4 or the C5 A6-allroad with the chain driven 4.2L 40 valve V8. Each Mechanical Adjuster requires on bolt and there is one mechanical adjuster per head, so one motor will require two bolts. Since these bolts are torque to yield (TTY), whenever the mechanical adjusters are replaced, these bolts need to be replaced as well. These bolts keep the motor in time by metal to metal contact and the amount of torque applied to the bolt. This part features the latest updated part number and comes directly from Audi. The OEM Part Number is N91086201 or N 910 862 01.